Hello! We are Emma and Shanice, two 2nd year Music Business and Arts Management students at Middlesex University. We are organising our first music event at The Slaughtered Lamb in Clerkenwell, as part of the charity Youth Music's, Give a Gig initiative. This will take place on Sunday, 24th March 2019. Sunday Sessions Live, is a music event working with young musicians in order to showcase their talent at The Slaughtered Lamb, a popular pub and home to live music in buzzy Clerkenwell. Our performers will include students from Middlesex University, The British and Irish Modern Music Institute, and The Institute of Contemporary Music Performance. All have agreed to perform without being paid a fee in order to help raise funds for the very worthwhile charity, Youth Music. We are really excited to be planning an event that will enrich the lives of young musicians in different ways. It will enable our young performers to hone their live performance skills and promote their music to potentially new audiences on the night, while simultaneously raising funds for a charity whose mission is to help young people through music. We believe that our event will have a positive impact on the local community in Clerkenwell, the musicians we are working with, as well as the young people who benefit from the grants and various programmes Youth Music provide. We will be selling tickets for the event itself and any money raised as a result will be donated to the charity. The event will take place on Sunday, 24th March 2019 at The Slaughtered Lamb, 34-35 Great Sutton St, Clerkenwell, London EC1V 0DX. Bringing communities divided by prejudice or gangs together to perform. Please read about the impact the charity has on young people's lives: https://www.youthmusic.org.uk/impact. For our project we are aiming to raise £200, which will cover our main costs and expenses. Both ourselves and the musicians involved in our project are contributing their time for free, so we are hoping that our crowdfunding efforts will help us to cover the basic costs and expenses we will incur, which break down as follows. £20 - Refreshments for sound check dates. Any money raised above our target will be donated directly to Youth Music. You can find out more about our rewards on the right hand side of our crowdfund page. These include a personalised 'thank you' for your support and a ticket to the event itself. We will be giving regular updates on our project via our Facebook page and we will also let you know how successful the event was and how much we raised for Youth Music the week after it takes place. THANK YOU AND PLEASE HELP SPREAD THE WORD! We would be very grateful for any donation that you are able to make to our crowdfunding campaign and/or your help sharing our crowdfunding page with anyone you feel may want to donate or attend the event itself. Your support means a lot to us (we really appreciate it!) 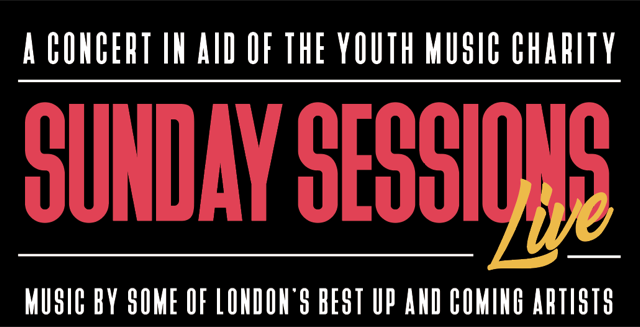 and we are excited to be organising Sunday Sessions Live in aid of Youth Music. A personalised thank you and shout out on our Facebook page! A FREE Ticket to the Event! + A personalised thank you and shout out on our Facebook page! A FREE ticket to the event, and a complimentary drink! + A personalised thank you and shout out on our Facebook page!